My kids have loved VEGGIE TALES since the 1st episode came out on VHS. 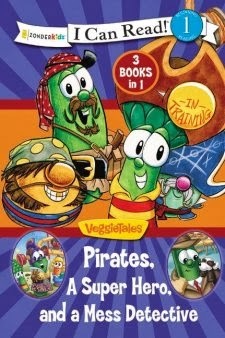 So, when I had the chance to review a new Veggie Tales book "PIRATES, MESS DETECTIVES, AND A SUPERHERO," I took it! Karen Poth is the author of this book. It is a hardback, colorful book that includes three Level 1 readers into one. A fun book for parents to read aloud to their kids; or it can give some fun reading practice to beginning readers as they read on their own. More accomplished readers would enjoy it also! The first story, "Pirate in Training," shares how Junior Asparagus didn't like school and wanted to play all day long, like a pirate. The pirates explained that it was hard work to be a pirate also, and that school can open up doors you would never be able to walk through without an education. The next story is "Larry Boy and the Mudslingers." It's a creative story about anger and forgiveness. Then, "Listen up, Larry" is a detective story that explains the importance of listening when someone is talking to you. I give the book a thumbs up. All three stories have good moral standards shared in a fun, simple way; and the illustrations are nicely done. So, if you and your kids enjoy Veggie Tales, this would be a good book to pick up. NOTE: I received this book free from the publisher through the BookLook Bloggers book review program. I was not required to write a positive review, and the opinions I have expressed are my own. I should have Jeremiah read Pirates in Training!! LOL. Sounds like your son and mine are similar in that regard.